To make the sauce: In a small saucepan, heat soy sauce, sweet chili sauce, honey, garlic and ginger on medium heat and bring to a boil. Turn down heat and allow sauce to simmer, whisking occasionally, until sauce is thick and bubbly. Remove from heat. 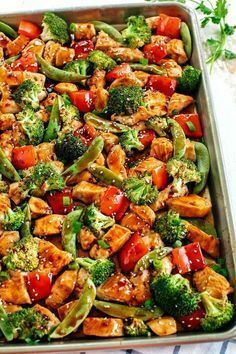 Spread chicken and chopped veggies on a baking sheet sprayed with PAM cooking spray and season with salt and pepper. Drizzle half the sauce over the chicken and veggies (reserving the other half for later) and toss to combine. Bake in the oven for about 20 minutes, tossing halfway through, and continue cooking until veggies are tender and chicken is cooked through. Drizzle remaining sauce over top and sprinkle with sesame seeds and green onions. Serve over brown rice or quinoa and enjoy!